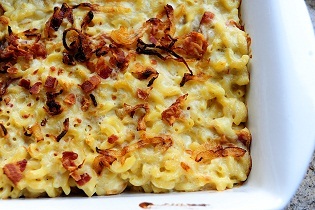 and it is the ultimate, most decadent macaroni & cheese ever. Cook macaroni for half the time of the package instructions. Drain and set aside. Fry bacon until slightly, but not overly, crispy. Drain on a paper towel. Reserve grease. Melt 4 tablespoons butter in a skillet and then saute onions over medium-low heat for 10 to 12 minutes, or until golden brown and soft. Set aside. Beat egg yolks and drizzle 1/4 cup hot mixture into the yolks, stirring constantly. Stir to combine. Pour egg mixture into sauce and cook for another minute. Add cheeses and stir until melted. Add onions and bacon and stir. Taste for seasonings and add more salt if needed. Add cooked macaroni and stir to coat.